The head and label maker of Amber & Amber Blue Recordings is back on his own imprint and all good things are known to be 3. So now appears the last part of the Nanobot releases. "Nanobot" has been maturing on the hard disk for some time and now sees the light of day in the third part. 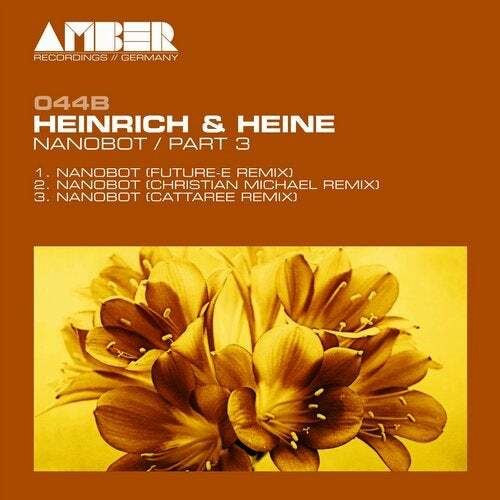 After the melodic Part 1 on Amber Blue and the Special with the Touchtalk Remix, "Nanobot" will now be released in a third part, following the motto "Forward Ever - Backward Never".This rather represents the more technoid part, whereby given by the original, surely all 3 remixes are more in the melodic techno direction. In any case, however, it is going forward and certainly geared only to the dancefloor.The blocking tip here forms Futur-E. He has made a name for himself with many releases on globally known labels in a very short time and delivers a real highlight with his "Nanobot" interpretation. In nothing below, Christian Michael and Cattaree join in and complete with their equally great versions this release and the Nanobot series perfectly. You should definitely listen, play or buy.